UN judges have ordered former Bosnian Serb leader Radovan Karadzic to spend the rest of his life in jail for the "sheer scale and systematic cruelty" of his war crimes a quarter of a century ago. Karadzic, 73, stood motionless and grim-faced in the dock as judges said they had upheld his 2016 convictions for genocide and war crimes during the conflict in Bosnia, and increased his original 40-year sentence. The panel of appeals judges in The Hague "imposes a sentence of life imprisonment" after rejecting Karadzic's appeal against his conviction for atrocities including the 1995 Srebrenica massacre, head judge Vagn Joensen said. 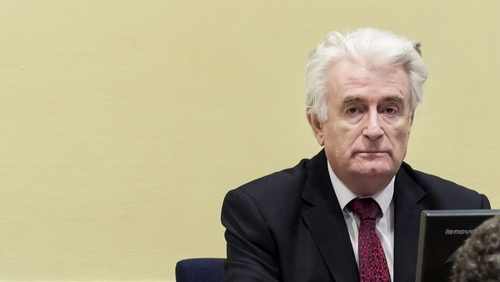 Judges at the original trial "underestimated the extreme gravity of Karadzic's responsibility for the most grave crimes committed during the period of conflict, noted for their sheer scale and systematic cruelty", Mr Joensen said. Bespectacled and with his trademark mane of white hair swept back from his face, Karadzic said nothing as the verdict was read out. In 2016, Karadzic was found guilty on ten counts including orchestrating a nearly four-year siege of the Bosnian capital Sarajevo, where more than 10,000 people died in a campaign of sniping and shelling, according to prosecutors. A delegation of the association of Mothers of Srebrenica are in the Netherlands for the judgment. Colonel Colm Doyle, a retired member of the Irish Defence Forces, served in what was then Yugoslavia with the European Community Monitoring Mission in the early 90s as the conflict between ethnic groups heightened. Speaking on RTÉ's News at One, Col Doyle said that during his time in the Balkans, he told Karadzic that he would be responsible for the actions of Bosnian Serbs. "I used mention to Karadzic any time there was an atrocity allegedly taking place that, as the political head of the Bosnian Serbs, he would have to take responsibility for what his subordinates did or did not do." Col Doyle served as a prosecution witness during the trial at the International Criminal Tribunal in The Hague. Col Doyle said Karadzic's "criteria" was that while Serbs were the largest ethnic group across Yugoslavia, if republics including Bosnia got their independence, Serbs would become minorities in certain areas. "The Bosnian Serbs were particularly against that," he said. "They felt if they were to become a minority under a majority Muslim government, that was something that was not acceptable." The area around Srebrenica had a majority Muslim population and was declared a safe haven by the United Nations. "One of the reasons the Bosnian Serbs wanted it was because it was fairly close to the borders to Serbia," Col Doyle said. "One of the arguments for the Bosnian Serbs was 'We would like to link up the territories in Bosnia that are dominated by Serbs to the territory of Serbia', which became later known as Greater Serbia." Despite Srebrenica being declared a safe haven, very few UN troops were put in to defend the town. "The Serbs determined to take it over and this is exactly what they did," Col Doyle said. During his trial, Karadzic said that soldiers and civilians who committed crimes during the war acted individually. However, Col Doyle said "Radovan Karadzic was political head and his enforcer, for want of a better phrase, was Ratko Mladic". Mladic was given a life sentence in 2017 for orchestrating massacres and ethnic cleansing during the Balkans war, including the Srebrenica Massacre and the siege of Sarajevo.